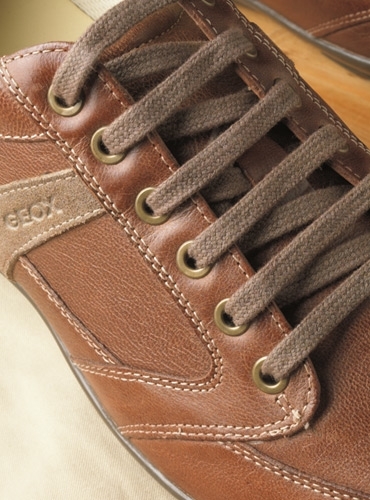 Geox's "Symbol" walking shoe offers both modern technology and maximum comfort in a walking shoe from innovator Geox. Patented technology combines a perforated sole with a resistant, breathable and water-repellent membrane, allowing natural temperature regulation and creating a micro-climate inside the shoe that leaves the foot dry throughout the day. 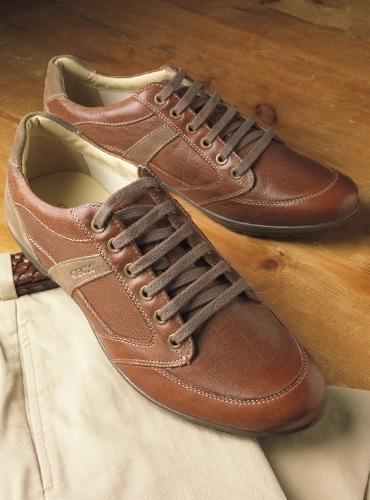 This ergonomic shoe has all leather uppers and a rubber sole. For more information on sizing, please see the "Sizing" tab. Featuring a waterproof and breathable membrane and perforated rubber sole. 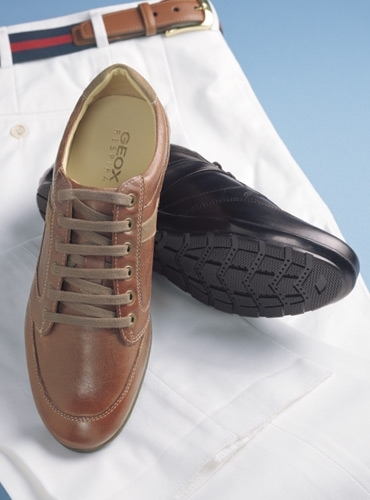 The Geox Patent Geox has perforated the rubber soles of its shoes and inserted a special microporous membrane that absorbs and expels sweat without letting water in. The membrane's micropores are smaller than water drops, which therefore can't pass through the membrane, but are later than the water vapor molecules. Sweat, in the form of water vapor, can pass through the membrane and out through the perforated sole. The Benefits The Geox patent reduces feet overheating: the gradual elimination of moisture from the interior of the shoe creates an ideal, healthy microclimate for the feet, keeping them warm and dry in the winter, and cool and dry in the summer.